Table tennis, more popularly known as ping pong, is a game that emphasizes friendly competition and entertainment. It’s a fun experience for young and old, whether they’re competing professionally or playing just for fun. It involves a very active lifestyle, and can keep you fit, sharpening both your reflexes and reaction time as well. Playing table tennis involves the use of two small wooden paddles, whose either face is covered in rubber or vinyl, to hit a lightweight ball made of hard plastic back and forth between players. Every game takes place on a ping pong table that is divided into two “courts” by a net. While every piece of equipment in table tennis is important, today, we’ll be looking more closely at the game area itself, the table. More specifically, we’ll be summarizing the traits that make any ping pong table great, and what you should be looking for if you’re looking to get one. Here are some factors to consider. A huge deciding factor as to how you’ll be choosing a table will be based mostly on what you’re looking to do with it. Do you plan on training for competitive play? Are you only planning on playing for recreation? Do you plan to play outdoors or indoors? 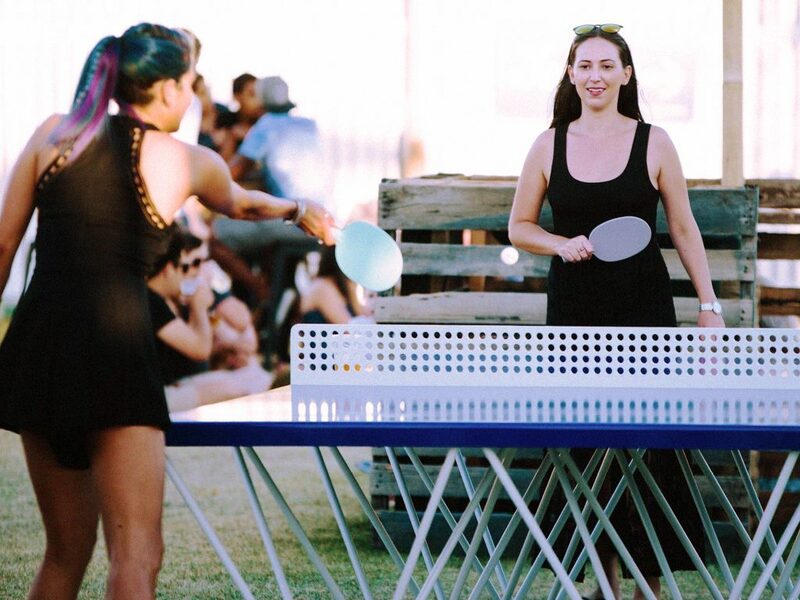 While one might think that choosing a ping pong table is straightforward, buying tournament grade tables for recreation or competition requires a bit more thought into it, and to maximize your choice, you need to be clear on what your intent is. Depending on whether you plan on keeping a table in one place or whether you might relocate it is a factor you’ll need to consider. If you plan on frequently packing it up, or if you find your available floor space couldn’t afford you to keep the table set up permanently, then you should go for a table that is easy to setup and to put away. A foldable model that can be easily set up by just one person will be perfect for your needs. There are also models available that have wheels on them, allowing you to easily put them away without the need to carry them. Depending on the brand, portable models usually sacrifice a lot of bulk and durability for portability, but a good brand is still good quality if nothing else. People who plan on using their table often will need to choose thicker tables. Most tournament grade tables are 1 inch thick and should be durable enough to withstand the constant use. For more casual players, having a thinner table should be enough, although do keep in mind that a thinner table means less durability. As a general rule, if you want to have a table that can last you a good long while, don’t pick anything that is less than 0.75 inch thick. It wouldn’t do for you to have a table with a good, thick surface if its legs couldn’t support it properly. If you plan on playing competitively, you’ll definitely be needing a table that can withstand and support its weight through years of abuse. Some models also offer you the chance to adjust the height of each leg, which can come in handy if you’re playing on uneven surfaces, like outdoors. You should also make sure that the height is the standard 30 inches tall. Always double check if the table you’re getting is perfectly smooth. Avoid ones that are warped and not straight, or ones that are made of materials prone to warping. Having a good, thick table that could have a few more years in its life will be useless if the surface isn’t completely flat. While having a level surface isn’t that big a deal if you’re just playing for fun, playing competitively with a warped table can cause your ball to bounce wrong. Choosing a table that isn’t prone to warp is also important if you plan to keep the table outside. Another important attribute to look out for is the net. Try to pick a net with attachments that don’t scratch the surface of your table. Some clamps have built-in padding that prevents this, but some don’t. If you want your table to maintain a smooth surface, either pick a net attachment that is padded, or you can make your own padding with rubber or cloth. Make sure that the net itself is also durable, and not easily cut. Another major factor to consider when you’re looking to get a table is whether you’re planning on mostly playing indoors or outdoors. If you have enough space inside the house, and plan mostly on playing table tennis indoors, then there aren’t much to think about other than what we’ve already discussed. If you plan on playing mostly outdoors, however, you’ll need to add a few more things to your list. Table tennis tables designed for outdoor use are usually waterproofed or weatherproofed to make them better withstand the elements. Most tables designed for the outside are made from metal, though some can be made of wood with special coating or some form of synthetic laminates. Generally, this special care for detail will cost more than indoor tables but is generally well worth it. A lot of players will need to consider the wind and the rain when they keep the table outside, as well as sudden temperature changes, which can cause severe warping. For competitive players, tables may cause balls to bounce differently depending on whether they’re kept outdoors or not. If how a table looks like is also important to you, you’ll also need to consider ones that have some sort of covering over them, as keeping them under the sun will eventually cause the paint to fade, or crack. Table tennis is a great pastime, whether you plan on playing with family or if you’re seriously considering going pro. It’s also a fun sport to watch. While all equipment in this sport is important, the table itself holds a vital part of the game. You can still play with subpar rackets, but you certainly can’t do it if your table isn’t up to snuff. Now that you know what to look for, however, the possibility of you getting a bad one is virtually zero.